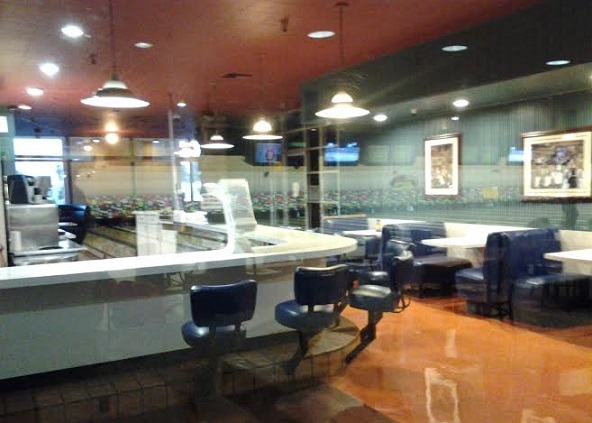 I intended to write a series of posts on bowling alleys, set up a format to do so, produced one on San Bernardino’s Arrowhead Lanes in November 2011, and then never wrote another one. Oops. Well, here’s the second in the series, and I promise not to wait three years for the next one. Possibly my favorite local bowling alley, Bowlium Lanes offers a burst of style on a dispirited stretch of Holt, even if the enormous pole sign fell victim to sign codes a few years back. Behind the flagstones, arches and dingbats on the exterior you’ll find more retro style inside: a cozy enclosed diner and vintage signs for restrooms and cocktails. The interior is well-maintained too. The lanes are kept well-oiled (possibly too well-oiled) and they have plenty of balls to choose from. The scoring machines are tricky to program, with directional arrows in multiple colors for navigation, and I kind of hate them. The graphics on the overhead screens are entertaining. 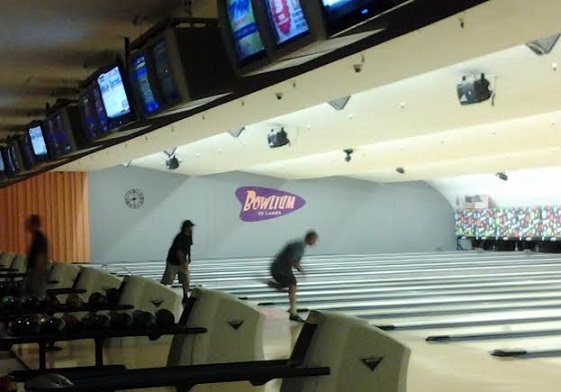 Besides the bowling, there’s a pro shop, a bar and a game room. 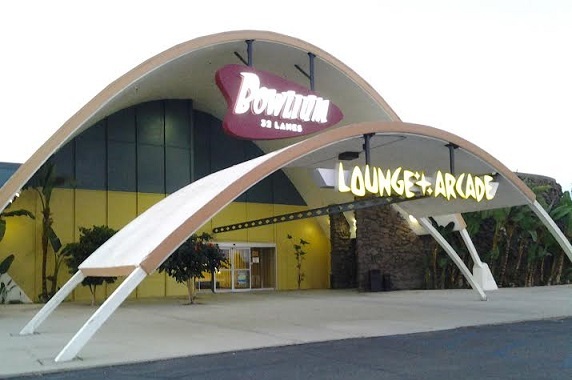 Bowlium is open 9 a.m. to midnight Monday to Thursday, 9 a.m. to 2 a.m. Friday, and 9 a.m. to 2 a.m. Saturday and Sunday. That’s not 24-hour bowling, but 17-hour bowling is impressive. Deal: Monday 9 p.m. to midnight: $1.25 per game, but there are more here. Ask your publisher Mark Givens about his former ‘zine, The Bowl Sheet. Its amazing that this place is still in existence, and according to your photos, it is obviously in great condition too. 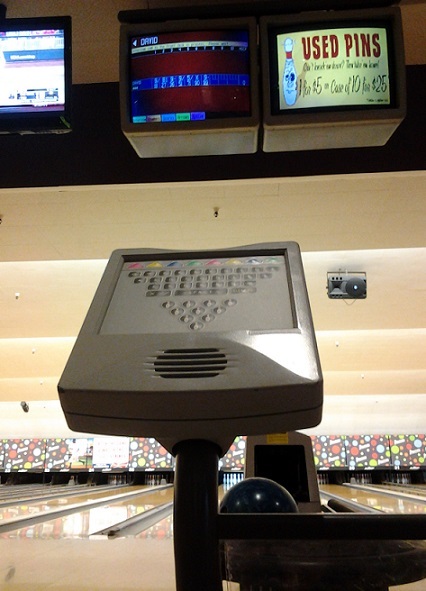 I was never a bowler–I was once a member of the Montclair Safety Committee, and we had our monthly meeting/breakfasts there–about 35 years ago. I think the sign should have been grandfathered.